Fort Myers City Hall is located at 2200 Second Street, Fort Myers, FL 33901; phone: 239-321-7000. Photo: Murphy-Burroughs House, ca. 1901, 2505 First Street, Fort Myers, FL. Listed on the National Register of Historic Places in 1984. Photographed by User:Ebyabe (own work), 2010, [cc-by-3.0 (creativecommons.org/licenses/by/3.0)], via Wikimedia Commons, accessed August, 2014. By 1880, a cluster of homesteads had been established around Fort Myers, which had been constructed as an outpost during the Second Seminole War (1835-1841). Because of its location near the mouth of the Caloosahatchee River, Fort Myers was chosen as the Gulf coast outlet in Hamilton Disston's plan (see: Lee County) to drain the Everglades Swamp and open a navigable waterway to his headquarters at Kissimmee on Lake Tohopekaliga. To do this, canals were to be dug from the head of the Caloosahatchee to Lakes Bonnet, Hicpochee, and Okeechobee. At the same time, a channel connecting Lakes Tohopekaliga, Cypress, and Kissimmee was to be opened to link with the Kissimmee River, which feeds into Lake Okeechobee. Disston envisioned steam ships descending the Mississippi River, then traveling along the Gulf coast, ascending the Caloosahatchee River into Lake Okeechobee, and continuing up the Kissimmee River to the new Kissimmee City "rising like magic in the wilderness of tropical verdure." By 1885, Fort Myers was a thriving village of 350 people, making it the largest town on Florida's Gulf coast south of Tampa. Prospects for continued growth were heightened by the arrival of Thomas Alva Edison, Fort Myers' most famous resident. Having spent several unusually cold and dreary months in St. Augustine in the winter of 1894-1895, Edison was attracted to Fort Myers' ideal winter climate. He eventually purchased a thirteen acres estate where he erected two houses and a laboratory. 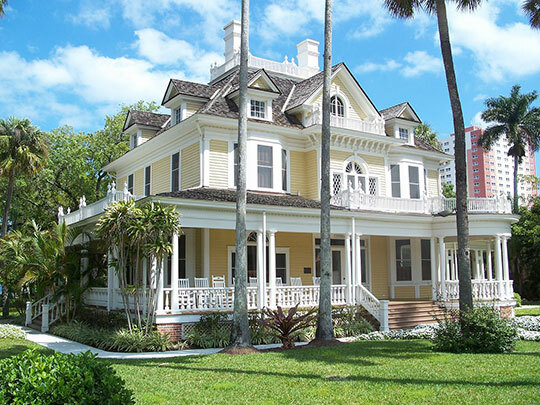 His choice of Fort Myers as a winter residence brought prestige to the community and helped spread its fame throughout the country. Other prominent men including industrialists Henry Ford and Harvey Firestone also constructed winter residences in the community. While Fort Myers received most of the new settlers during the 1880s, the interior areas of Lee County, especially along the Caloosahatchee River, were also popular destinations for newcomers. Large plantations were established by farmers who raised a variety of crops, including citrus, coconuts, pineapples, and sugar cane. An experimental agricultural station was established by Dr. L.C. Washburn at East Fort Myers in 1882. The banks of Twelve Mile Creek were lined with the farms of some of the early settlers of Fort Myers who had chosen to leave the village to homestead. A few miles to the east, Dennis O. Hickey established a plantation that raised cabbage, eggplant, and squash along a creek that now bears his name. The community of Buckingham, located on the Orange River south of State Road 80, was founded in 1884 by Edward Marshall Williams. A native of Pennsylvania, Williams established a citrus grove, planted vegetables, and grazed cattle on his homestead before the great freeze of 1894 dampened his enthusiasm for farming, causing him to move to Fort Myers. Other settlers who followed Williams to the area surrounding present-day Buckingham remained to continue farming and raising cattle. The growth of the population of Fort Myers during the 1880s resulted in important political changes for the community and the county. In August 1885, the residents of the settlement voted to incorporate as a town. They elected a mayor and seven councilmen, who were given the power to levy taxes to make improvements to the town. Sentiment was also growing for the creation a new county, separate from Monroe County, that would better serve the needs of residents of the Caloosahatchee River region. The seat of Monroe County, a sprawling jurisdiction covering most of southwest Florida, was the distant island city of Key West. The movement for separation gained momentum in 1886, when a plea for a new school house at Fort Myers was unceremoniously declined by Monroe County officials. A group of prominent citizens, led by several powerful cattlemen from Fort Myers, petitioned the Florida Legislature to create a new county to be named in honor of Confederate general Robert E. Lee. Lee County was formally established in May 1887, and included the areas comprising present-day Hendry and Collier Counties. Stephen Olausen, Sherry Piland and Carl Shiver, Florida Bureau of Historic Preservation, Historic Resources of Lee County, 1881-1950, nomination document, 1999, National Park Service, National Register of Historic Places, Washington, D.C.